Philippine Endurance Challenge (PEC), the organizers of the country’s longest endurance race, will once again test man and machine against the clock in a new, more compact event. 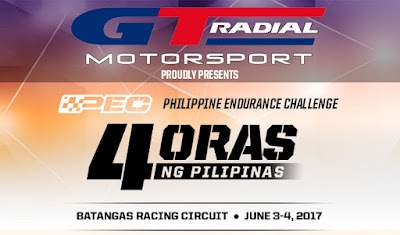 The inaugural GT Radial x 4 Oras ng Pilipinas is where teams of 2 to 6 drivers compete 240 minutes non-stop around the track. This is a true endurance race that include pit stops, re-fueling, safety cars, and tire changes. It will take place on June 3 - 4, 2017 at the Batangas Racing Circuit (BRC) and serves both as a proving ground and prerequisite to the full-on 8 Oras ng Pilipinas later in November. Each team may enter in any of the 4 categories. The RP Class is the race prepped or unlimited class for race cars. FM-1 is for slightly modified street cars with more than 150 horspower, while FM-2 is for cars below 150 horsepower. Lastly, the Manufacturer’s Cup is exclusive for showroom stock vehicles with no modifications except for safety equipment. After battling it out wheel-to-wheel for 4 hours, the entry which completes the most number of laps win. Awards will be given to the Top 3 finishers in each class and the Top 3 teams competing for team points. Registration for the GT Radial x 4 Oras ng Pilipinas is now open at P 30,000 per entry. Take advantage of the early bird discount and join for only P 25,000 on or before May 15, 2017. Entries close on May 31, 2017. For more info, registration details, and rules & regulations, contact the FlatOut Race Series via email or visit the Philippine Endurance Challenge page on Facebook. Kia Takes Special Kids to "Kamp"
The 2017 Mazda Miata Cup is On!